Toilets are important pieces of equipment, used every day, and one of the most overlooked pieces of a bathroom. People will focus more on a bathtub or the vanity instead of focusing on the toilet. There are many types of toilets, such as traditional, low level, back to the wall, wall hung, and many more. But it is really important to know that not all the toilets are the standard toilets. Water saving. Some toilets could have a water sense certification, high-efficiency toilets flushing with 1.28 gallons or less per flush, as compared with the 1.6 gallons of conventional toilets. Dual flush. Do you want to choose a toilet that can provide you with the ability to have a partial flush for liquids or a full flush for solid waste? Toilet bowl height. Comfort toilets are considered non-traditional toilets. A standard bowl rim is located about 15 inches above the floor, but toilets bowls at 17 inches are considered the best ones. A 17-inch and even a 19-inch toilet bowl height will also be in compliance with the Americans with Disabilities Act. Bowl shape. An elongated bowl occupies more space, but provides more seating space and allows fewer odors to escape. Take this into consideration as an elongated bowl could be up to 6” longer than a standard bowl. One piece toilet. Two-piece toilets are cheaper than a one piece but they tend to accumulate dust in between the tank and the bowl. One-piece toilets are more expensive and can be harder to install than a two-piece toilet. As for performance they are almost the same. Flush systems. Rubber flappers are things of the past. Look for newer flush towers that are more reliable than old flappers. Pressure-assist toilets are more water-efficient flushers than gravity toilets. Valve. Go after toilets that have at least a 3-inch flush valve. Traditional toilets have a 2-inch valve that delivered less thrust than new ones. Rough-in dimensions. 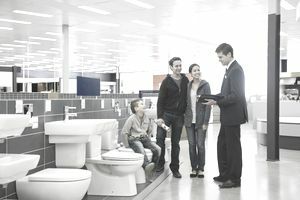 Distance from the back wall to the water line entrance varies from model to model, so ask before you get your new toilet. Noise. Noise could be a factor when your toilet is going to be installed near high transit areas. Color. More than 80 percent go after traditional white, although more and more people each day are trying new exotic colors. Water lines. Use flexible stainless steel water lines instead of or rigid chrome-platted copper lines. Shut-off valve. There are multiple types of connections for a shut-off valve. Solder connection and a compression connection are the most used, but be sure that you don’t have old iron pipes as they might require some sort of different connection. These are the top toilet manufacturers that you can find in the U.S. It will all depend on previous factors and how much money the client is willing to pay. Toto is one of the big 3 toilet manufacturers but comes at a cost. Kohler offers very good products at reasonable prices. For the price, the American Standard toilet is a worthy competitor.